BPM 1.5 ships with a 19GB sound library. PRESS RELEASE: MOTU is now shipping BPM Version 1.5, a major update of MOTU's rhythm production virtual instrument and UVI sound library for Mac and Windows. BPM 1.5's expanded library of over 19 GB of kits, patterns, samples, loops, and instruments covers dozens of new musical styles, such as big beat, dancehall, dub, electro, hard trance, house, drum 'n' bass, progressive, and others. New software features include enhanced support for hardware MIDI controllers, a note repeat function, and bank effects that can be saved with kits. "With its expanded sound library and enhanced MIDI controller support, BPM delivers the ultimate cutting-edge virtual instrument rhythm programming experience," said Jim Cooper, MOTU Director of Marketing. BPM 1.5 includes Beat Box Anthology, a comprehensive 4 GB collection of legacy rhythm sounds (over 10,000 samples) from 80 classic drum machines from the 1970's, 80's and 90's — iconic rhythm machines from decades past that established the legendary sounds that still drive today's beats. Users can browse individual samples, kits, and patterns from three categories of devices: classic, analog, and digital, the "classic" category being reserved for machines that attained true cult status, such as the 808 and 909 series. Samples are also organized by type (kick, snare, etc.) for easy browsing. Utmost care was taken in sampling the original instruments, with 24-bit 96 kHz audio quality and professional mastering of all samples at Sterling Sound in NYC. Users can combine kits and patterns from each style to quickly create unique hybrid beats. BPM 1.5 also introduces bank aux FX, which allow users to create three independent effects processing chains for a bank of sounds, apply the effect chains as desired to each individual component sound of the bank, and then save the effects with the bank. This new feature makes the effects an integral part of the bank, so that when the bank is saved with a pattern, the result is a fully programmable FlexLoop. As a software-only virtual instrument, BPM 1.5 has been enhanced with programmable MIDI remote control features that allow it to work seamlessly with third-party hardware controllers, including pad controllers and MIDI keyboards. 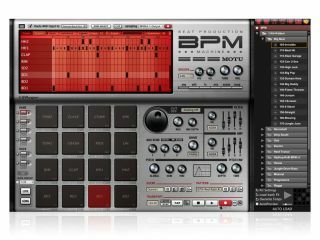 BPM ships with hardware template files for several popular drum pad controller products, such as the Akai™ MPD Series. When loaded into the hardware, the template file quickly programs the controller for use with BPM. Users can further customize their beat making experience using BPM's new MIDI Remote preferences, a long list of BPM functions that can be attached to any MIDI controller key, switch, fader, or knob using "MIDI learn" functionality. The new MIDI Select feature gives users direct access to each pad — up to 64 simultaneous pads per scene — for quick editing and tweaking directly from a MIDI controller. For example, if a user needs to tweak the filter cutoff on the crash cymbal, they simply play the crash cymbal pad and then twist the assigned knob to tweak the filter. To repeat the currently held note, users hold down the Note Repeat button. Any note repeat value, from triplet 64ths to dotted quarters to 32x, can be chosen. The note repeat button can be used on-screen or mapped to any control item on a MIDI controller. Users can even change the repeat value on the fly from their controller. Volume (velocity) of repeated notes is controlled with aftertouch pressure. The Beat Box Anthology serial number is used to deposit an authorization in the user's ilok.com for download into their BPM iLok. BPM 1.5 is now shipping. Price remains the same at $295. Registered 1.0 users can upgrade to version 1.5 for $79.